Rev. James Gruetzner was born in Austin, Texas, on November 30, 1932, adjacent to the campus of Concordia College to Otto Karl and Andanilla Balke Gruetzner. He attended St. Paul Lutheran School and was confirmed on Pentecost Day 1945 by Rev. Albert F. Jesse. He began his study for the ministry at Concordia Lutheran College in Austin, then St. John College in Winfield, Kansas, and graduated from Concordia Seminary in St. Louis in 1956. He spent a summer vicarage in Spanish missions serving congregations in Harlingen, Mercedes, and Santa Maria in the Rio Grand valley of Texas and one year internship at Trinity Lutheran Church at Great Bend, Kansas, under Rev. Arlen J. Bruns. He was married to Mildred A. Bethke on June 13, 1954, by his uncle, Rev. Albert Gruetzner, at Raymondville, Texas, and was ordained as a missionary to eastern Nevada in a mortuary chapel in Ely, Nevada, in July of 1956. He established and helped build Immanuel Lutheran Church in Ely and St. Mark Lutheran Church in Elko, 192 miles apart, from 1956-59, before accepting a call to Bethlehem Lutheran Church in Palestine, Texas, which he served until the summer of 1964. Then, Rev. 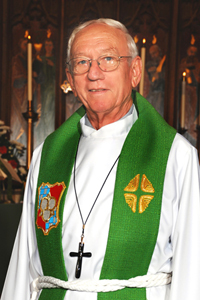 Gruetzner received and accepted a call to Our Redeemer Lutheran Church in Washington, Michigan, where he served as pastor for 32 years before retiring. While in Texas, he and his wife served as camp counselor and camp nurse at Camp El Har in Dallas. While at Washington, he served as counselor for the Utica zone LWML, the board of directors of Samaritan House in Romeo, president of the Washington Council of Churches, and Circuit Mission Representative. In November, 1998, Pastor Gruetzner joined the Cathedral ministry of Historic Trinity Lutheran Church as an assisting pastor. Rev. Gruetzner and his wife, Millie, live in West Bloomfield, Michigan. They have four children: James, Jan, John Karl, and Joan, and eleven grandchildren, and one great-grandchild. Mrs. Gruetzner worked as a contingent in the endoscopy department at the Surgical Center of Michigan in Troy.